Growing up, I heard stories of the life my grandparents had in Güines, Cuba, a town about 30 miles southeast of Havana. My grandfather ran a successful newspaper and my grandmother enjoyed her life as a homemaker raising their three children. When Fidel Castro came to power in 1959, the government shuttered my grandfather’s newspaper business, telling him he could still work there, but they owned it now. Faced with losing everything had worked for and the threat of my uncle being forced into the military at the age of 13, my grandparents chose to flee to the United States. They sewed what money they had into the lining of their clothes, only to watch soldiers at the airport tearing apart the clothing of other passengers. My grandfather frantically took out the sewn money and passed it under a glass partition to friends who were remaining behind. This was done with the promise that family members of these friends, who were already in the U.S., would repay the money. My family arrived in America with only their children and the clothes on their backs. Even though they were happy to be safely out of Cuba, becoming accustomed to a new country, adapting to a new language and embarking on the road to citizenship would not be easy. After a couple years, my grandparents settled in Chicago. My grandfather opened a small store, while my grandmother worked in a toothbrush factory. She took night classes to learn English, and they did their best to acclimate to their new home. As a young girl, I remember attending huge New Year’s Eve parties at the Cuban Chamber of Commerce in Illinois. These gala events were stocked with delicious food, fancy dresses and the Macarena — which, by the way, I heard for the first time at a Cuban NYE celebration YEARS before it hit mainstream radio. My grandparents split their time between Chicago and Miami, and I was fortunate to see them relatively often. During my time spent with them over summer and winter vacations, I would listen to their stories while eating all of the black beans and rice — also known as Moros y Cristianos. I always admired my grandparents’ tenacity and desire to connect with me, their American-born granddaughter, which must have been difficult due to distance and differences in culture. My grandfather only knew basic English, but he would always ask “are you happy?” when we talked — his way of encompassing “are you okay?”, “how is school?”, “how is life?” and “how is your family?” in one loving question. I had hoped to visit Cuba with my grandmother at some point, but unfortunately, she passed away before we could make a trip together. Luckily, my mom is amazing and embarks on a “girl’s trip” with me once a year. She has always supported and encouraged my interest in visiting Cuba. While we had always discussed the possibility of going there, the idea simply wasn’t an option due to long-standing travel restrictions. This past year, however, all of that changed. In 2017, Carnival Cruise Lines began sailing to Havana. We saw our chance to finally make a trip. We read up on the experiences of others and did research on how we could be granted entry via one of the 12 authorized categories, as travel for American tourists is still restricted. exportation, importation, or transmission of information or informational materials and certain authorized export transactions. We decided on an 8-hour tour that offered both educational activities and public performances and booked our trip for Summer 2018. Our cruise embarked from Tampa, Florida on July 2nd, and we spent the first few days enjoying time at sea and celebrating the Fourth of July in Key West. Our ship arrived in Havana, Cuba around 5 a.m. on July 5th. We boarded on a large, air-conditioned bus headed for Castillo de los Tres Reyes Magos del Morro, also known as Morro Castle. Constructed in 1589 to fend off pirates and raiders, today the historic site is a popular destination for visitors. After touring the grounds, we returned to the heart of the city, Plaza de San Francisco and Calle Mercaderes. Standing there in that square, a wave of emotion washed over me. The realization that I was finally where my family once stood felt overwhelming and incredible all at once. We watched street performers and admired the architecture of the plaza before being guided down brick and stone-paved streets lined with historic buildings dating back to the 1600s. We paid a visit to a local restaurant, La Moneda Cubana (The Cuban Coin), a “paladar.” Paladars are restaurants run by self-employers. This means these restaurants are family-run, as opposed to state-run, and authentic to the true Cuban experience. The paladars are very much “come as you are” and are not glitzed-up for the benefit of tourists — this provides a wonderful, unique dining experience that enables you to feel truly immersed in the culture. We were each greeted with a refreshing Rum Collins — a traditional Cuban drink made with fresh lemonade, rum and cane sugar — and a raspberry mojito made with Havana Club, the famed Cuban rum. It was so hot that the ice cubes only lasted a few seconds in our glasses. We then dove into a three-course meal, beginning with a basket of fresh bread rolls and a wonderful homemade aioli. As an appetizer, we enjoyed Sopa de Mariscos, also known as Mariner’s Soup, which had whitefish, scallops and shrimp in a tomato-based broth. In Cuban households, this soup is made with seafood left over from a previous evening’s dinner to ensure no food is wasted. For our main course, we ate Pescado Escabeche. Escabeche is a, perhaps surprisingly, historically Arabic meal that eventually made its way to Spain prior to the 13th century. It has since become a popular meal in Latin American countries like Cuba. 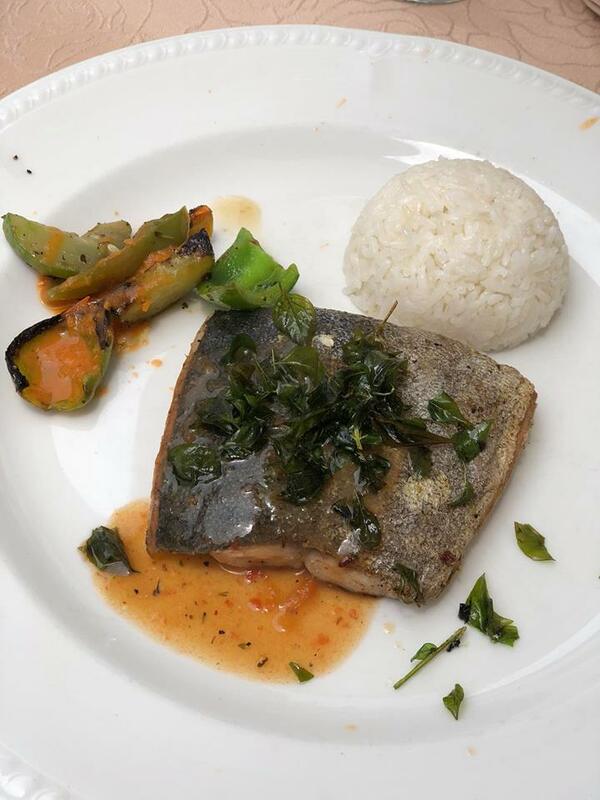 This delectable dish consists of pickled whitefish coated in a sweet-and-sour glaze, served with white rice and vegetables with Mojo Criollo sauce, which is comprised of citrus juice and garlic. You know the old saying, “there’s always room for dessert?” There was absolutely room for the delicious Natilla de Chocolate that came our way last. 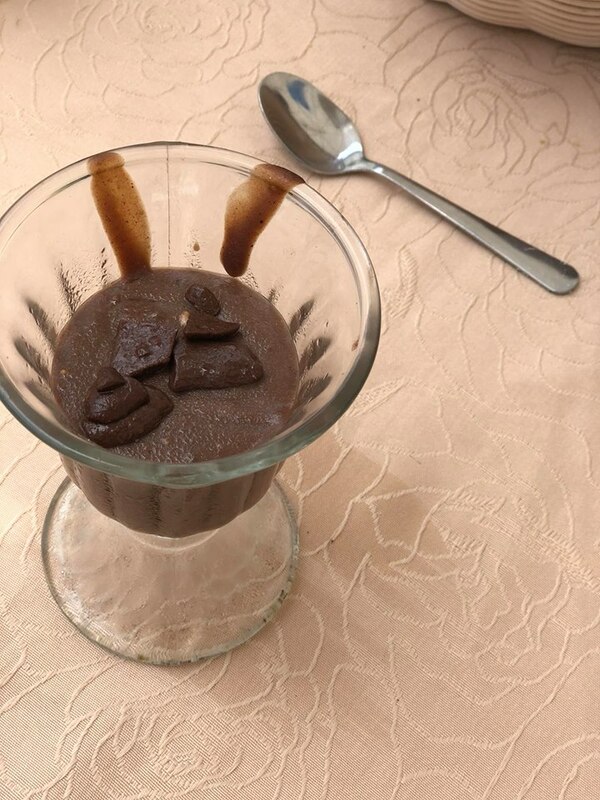 This chocolate custard treat is a Cuban favorite, usually made by grandmothers for their sweet-toothed grandchildren. Occasionally dressed with Nilla wafers or little bits of chocolate bars, this cold dessert was a welcome ending to our meal on a hot, humid day. The relationship between people and food in Cuba is an interesting one. The country is a melting pot of cultures with heavy dashes of African and Spanish influence, and this resonates in every dish served. Fresh fruits, seafood and staples such as bread, beans and rice figure heavily in the Cuban diet, largely because of rationing imposed by the government. Cubans are forced to rely on a distribution system known as the Libreta de Abastecimiento (translated literally as “Supplies Booklet”). This system establishes the allowed rations citizens are able to buy, and the availability of these items (mostly imported) is closely guarded. The elderly, children under the age of seven and pregnant women are provided 1 liter of milk per day. Each Cuban is allowed to purchase up to 6 pounds of rice, 20 ounces of beans, 3 pounds of sugar, 12 eggs and 15 pounds total of potatoes and bananas per month. Additionally, chicken is distributed at 1 pound per person every 15 days. The total cost of this is equivalent to spending about two U.S. dollars for a month’s rations, and the items are delivered to each home — albeit not necessarily in a timely manner. At one point in the system’s history, items like clothing, shoes, household items and toys were also rationed. Each child was allowed 3 toys per year. While this system surely seems crazy to most Americans, our tour guide, a Cuban native residing in Havana, emphasized that Cubans focus on how much is provided for them. Most Cubans pay no rent; healthcare and education, including college, is provided at no cost. Women and men are paid the same based on their level of education and experience. Additionally, due to the low income most citizens receive, it wouldn’t be practical to shift to an “open market” grocery plan as many wouldn’t be able to afford what is sold. This portion of my trip caused me to reevaluate my lifestyle and cherish privileges I had previously taken for granted or perhaps didn’t pay much attention to. I never realized that the favorite dishes my grandmother prepared were both culturally significant and based on the availability of items now had access to in America. The lesson? Don’t turn down food older family members make for you — it comes straight from their heart, and possibly your heritage. If you’re interested in hearing about the next 12 hours of my trip, stay tuned for the November edition of CounterCultures, when I’ll share a video of rapping abuelitas and detail my evening at the infamous Tropicana nightclub. Questions about travelling to Cuba? Feel free to contact me at cmitchell@nullbbrcreative.com. While you’re cooking up those holiday favorites, deck your halls with these jingle jams that are sure to get you in the Christmas spirit.